Whatever may be the type of your industry or its material handling requirements, ElectroMech can craft the most pertinent solution through our wide product range or a customized product developed just for you. From most simple to extremely challenging requirements, you will find ElectroMech solutions working efficiently practically everywhere. In automobile plants, engineering industries, process plants, infrastructure projects (construction, power, metro rail, shipyards, steel, etc.) and in thousands of SMEs. ElectroMech systems are literally spanning the length and breadth of the nation. And in over 50 other countries too. Serving thousands of industries and handling millions of tonnes of load every hour. Are you too facing a lifting and handling challenge in your industry? Do contact us. We sure have something special for you. Our Research and Development team works continuously to maintain the highest product quality and offer our clients the most up to date solutions. ElectroMech has always prided itself in being at the forefront in adopting the latest technological advances in cranes and is considered as a pioneer in the field. Constant development is being undertaken with the sole intention of maximizing the value delivered to the customer in terms of lower total cost of ownership, higher reliability, higher safety and faster productivity. The design team is equipped with state-of-the-art facilities. As a result of our pursuance of world-class technology, our equipment are operating flawlessly at diverse locations. ElectroMech is known for providing most appropriate material handling solutions to various industry segments. While recommending a perfect solution, we take into consideration several aspects. This includes a preliminary study of the factory / site, in-depth analysis of existing and planned material handling requirements, production speed, work-flow, plant integration possibilities and environmental aspects. 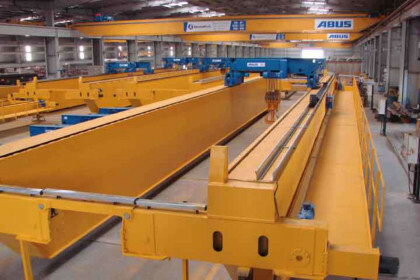 Our wide product range and more than 35 years’ experience of thousands of crane installations for a variety of applications allow us to design and recommend a perfect solution. Over the years we have designed and developed hundreds of customized solutions for our clients, be it variations of existing products or completely new products developed from the ground up. It is this capability to develop pertinent solutions that not only take into consideration your existing needs, but also your future requirement and possibilities of expansion that make us proudly stand tall as India’s largest industrial cranes manufacturer.